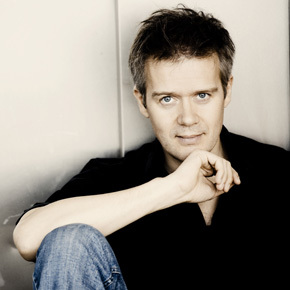 Regular followers of the Los Angeles Philharmonic will have encountered the work of Michel van der Aa before, but Up-close has intensified his profile, particularly in North America, thanks to the acclaim it earned last year, when it received the mega-prestigious Grawemeyer Award for Music Composition. Written in 2010 on a commission from the European Concert Hall Association and the Dutch Performing Arts Fund for the Amsterdam Sinfonietta and the Argentine cellist Sol Gabetta – who premiered it in Stockholm in March 2011 – Up-close represents nothing less than a thorough reimagining of the concerto genre to mirror the way our high-tech, wired era shapes and compartmentalizes perceptions of reality. Like Louis Andriessen, an important mentor with whom he has collaborated on such works as the multimedia opera Writing to Vermeer (1999), van der Aa has evolved a music theater aesthetic that resists classification in its intriguing combination of live performers and film visuals. The younger composer (born in 1970) studied recording engineering as well as composition in his native Holland and later enrolled in classes at the New York Film Academy. Many a composer combines multiple talents within the realm of music, but van der Aa brings a synthesis of composer, stage director, and filmmaker to several of his endeavors, including Up-close. Van der Aa has also created works showcasing each of those talents separately. He emphasizes that his use of film visuals and extra-musical components has to be “a necessity,” not an adornment “which is there merely to be hip or entertaining. I try to be strict with myself, to use film in a way that extends and enhances my musical vocabulary. The film contributes something I can’t communicate with the music alone.” In Up-close, Van der Aa points out, he conceived the music “in parallel with my work on the script for the film and the small staging. These feed into each other. I like that flexibility. Sometimes the music gives me visual ideas, and sometimes it’s the other way around.” He considers Up-close to be a work of music theater, the cello concerto embedded within as a part interdependent on the whole. Along with the familiar three-movement concerto format which he uses as a formal design for Up-close, van der Aa explains that the relative significance of its constituent layers likewise structures our sense of unfolding events. Their interrelations also pose unique challenges of synchronization. There are three such layers: the conventional one of the solo cellist and the all-string ensemble, the “mirror reality” of the film that is projected simultaneously, and the prerecorded sounds (encompassing electronic samples and the film’s soundtrack). There is a fourth layer, which is less extensive, pertaining to the instructions for the soloist to take part in the mise-en-scène (as at the end of the first movement, when the cellist gets up and moves a lamp on the stage). “It provides a way of exaggerating the inherent theatricality of instrumentalists,” according to the composer. The soloist is required not only to perform with traditional musical virtuosity but also to act. The gulf separating the illusionistic reality of the film and that of the live performance becomes one of a cascading series of metaphors for what van der Aa has described as “a dream about communicating” which in the end fails. For the frenetic final movement, the code machine “ignites the ensemble” back into action, as the strings pulsate with a nervous energy at times reminiscent of Bernard Herman. Van der Aa likens the musical patterns of their “timbral counterpoint” to “little wood fires spreading through the ensemble,” while the woman in the film becomes increasingly anxious. (c) 2014 Thomas May — All rights reserved.